Iranian patrol boats have forced a US-owned cargo ship, travelling under a Marshall Islands flag in the Persian Gulf, into the port of Bandar Abbas in southern Iran. 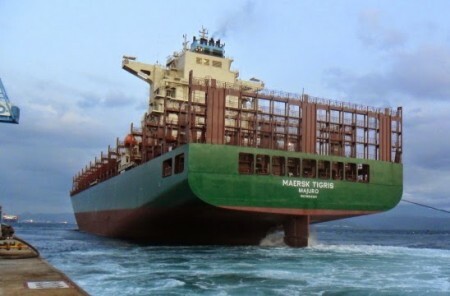 The Maersk Tigris, with 34 crew, was boarded by the Iranians in the Strait of Hormuz on Tuesday. Iranian media claim the vessel “trespassed on Iranian waters”. The Iranian boats fired warning shots across the bow of the cargo ship when it did not obey calls to divert further into Iranian waters. The Maersk Tigris sent a distress call to the USS Farragut. Iran’s media say the destroyer left after Iranian forces told it not to intervene. The Pentagon says that the ship is maintaining a position about 60 miles away and American aircraft are on stand-by. Colonel Steve Warren, a Pentagon spokesman, said the ship “complied with the Iranian demand and proceeded into Iranian waters in the vicinity of Larak Island.” He said there were no US nationals aboard and nobody was injured in the incident. The Pentagon said the Maersk Tigris was “an internationally recognized maritime route”. An Iranian Foreign Ministry official that the ship has been seized over “financial violations”. Fars News, citing an unnamed source, said the ship owner has overdue debts to Iran’s Ports and Maritime Organization, which requested the seizure. Cor Radings, a spokesman for Rickmers Ship Management, which manages the Maersk Tigris, said “the ship is at least partially, possibly 100% owned by American investors“.